If you open up a dictionary or encyclopedia to any random page, you’ll have no trouble understanding the entry you stumble across. These books are designed to give you snapshots of information, and not much more. We all know, however, that the Bible doesn’t quite work that way. First, the Bible is a collection of types of books—history, poetry, biography, letters, apocalyptic imagery, etc. We don’t read the Bible like we read a history book about World War II or a biography on Martin Luther King, Jr. The Bible contains all kinds of books. It is a library of writings developed and collected over thousands of years. Though it has one coherent message, we can’t read Lamentations and Philippians the same way, because they weren’t written for the same purpose, during the same time, or by the same type of author. And they were all written 2,000+ years ago, in different times and places than our own. Second, and related to the first point, the Bible is a story, not an encyclopedia. The Bible is meant to be read as one unit, not picked through like a Sunday buffet. We can’t understand the New Testament without the Old Testament. We can’t understand Jesus’s life and ministry apart from Genesis, the Psalms, Isaiah, etc. So, while there are many types of books over a long period of time within the Bible, they rely on each other and explain each other. Once we understand these things, we can then ask the question, what do we do about it? Not everyone has time, energy, or even the calling to go to seminary. The vast majority of Christians in the world are not paid by a church or organization to study the Bible every day. But God’s Word is for all of us. The Bible was written to reveal God to us, show us how to worship him, and train us in becoming more like Christ by the power of the Holy Spirit. Since this is true, the good news is that the Bible shouldn’t scare us. It should, instead, invigorate us. The God of the universe revealed himself to us! Here are four tips to help you understand any passage of the Bible. I hope these tips will remove some of the mystique around reading the Bible, and encourage you to take the step toward reading it regularly. 1. Pray before you read. In 1 Corinthians 2, Paul tells us that we can only understand the things of God through the power of the Spirit. We can read and read and read the Bible all day long, but only the Spirit can reveal to us the wisdom and truth that God has for us. We should come to the Bible humbly, first admitting that we need the Spirit to help us understand. 2. Read more than a few verses at a time. This goes back to the Bible not being an encyclopedia. Books of the Bible were written to be read in only a few sittings (at most). In fact, it is a rather modern idea to that take isolated verses or passages and apply them to our lives; books of the Bible were often read in large chunks. Paul’s letters, for example, were read aloud in their entirety to churches. It is always beneficial to read at least the chapter before or after the passage to help you understand the broader idea. Buying a reader’s Bible might help you here, because it removes the chapters and verses (which the original Bible manuscripts didn’t have), allowing you to read it like a book and get lost in the story rather than simply trying to meet your verse/chapter quota for the day. 3. Use a study Bible. I cannot stress this point enough: buy a study Bible to pair with your reading. Study Bibles contain tons of notes that help explain each passage of the Bible. Not only that, but they offer cross-references to help you see other passages that relate to or are the foundation for the passage you’re reading. You don’t have to look at every note and study the Bible like a textbook, but this will help you better understand confusing passages and words. 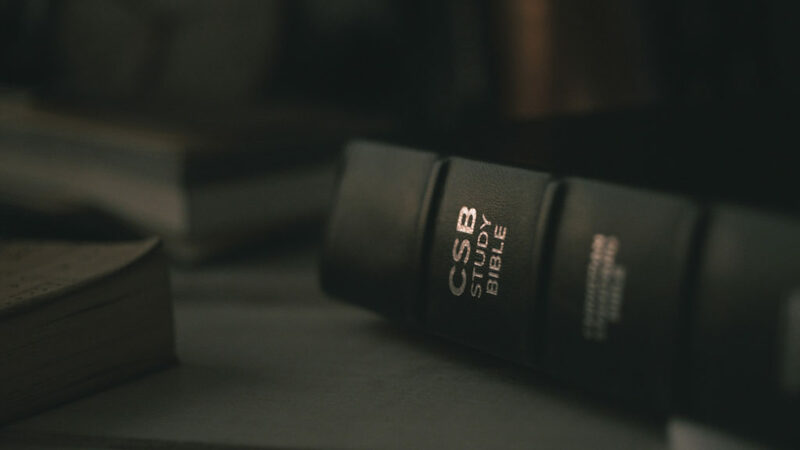 Study Bibles take some of the mystery out of Bible reading, and help relieve some of the anxiety we all feel when we open its pages. The Bible is not meant to be read alone. The original audiences both heard and read the Scriptures in group settings as communities. God’s Word is for us. There is no such thing as solo Christianity, and therefore there is no such thing as solo Bible reading. Yes, we should read alone and in private prayer, but we should also read with others, soaking in the wisdom and encouragement God has given them through the same Word. Reading God’s Word with God’s people is an opportunity for every part of the body to consider how we should function together on Christ’s mission. Whatever you do, just read the Bible. Try starting in the Psalms or the Gospels, which are rather straightforward books. The Psalms teach us how to worship God and pray to him, even in the distress of life. The Gospels tell us stories about our Savior. But eventually, don’t avoid Leviticus, Revelation, and other more “peculiar” books. They are all meant to transform you by setting your eyes on their ultimate Author.